President Michael Sata has been advised to further reduce his work-rate due to his latest medical complication that saw him travel to India and UK for treatment. 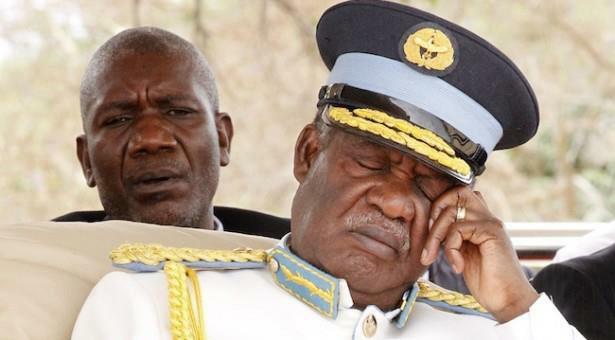 Sources from State House have told the Watchdog that president Sata has now been advised to preferably only work three days in a week unless there is a pressing issue or something urgent. The medical team have further advised the president to only work from 08:00 hours to about 14:00 hours in the afternoon, unless there is something pressing but should never stress himself at all times. Sources said Mr. Sata’s reduced work-rate is a complete departure from past presidents that used to work long hours sometimes in the night. According to sources, late president Frederick Chiluba used to report for work around 06:00 hours to around 22:00 hours in the night. Sources said Mr. Chiluba at times used to address heated cabinet meetings till late in the night. Chiluba’s working late tradition was also continued with late Levy Mwanawasa who at times used to report around 05:00 hours to around 22:00 hours Monday to Friday and even extra hours during weekends. Sources said for Mwanawasa, he would also knock-off late in the night and carry some files and reports to Nkwanzi House (presidential residence) for further scrutiny. The only time Mwanawasa started reporting around 07:00 hours is when started jogging early in the morning at Mulungushi service club owned by the Office of the president. Sources said both Chiluba and Mwanawasa used to have weekly Monday cabinet meetings as that was ideal since parliament does not sit on Mondays when it is in session. Sources said cabinet is ideally supported to sit once in a month, but that is just a minimum requirement as no president has ever-relaxed things to that level. The only president who relaxed a few things was Rupiah Banda who reduced the cabinet meetings to twice monthly, but even then he formed a number of cabinet committees that he was meeting regularly before the main cabinet meeting. And all the previous presidents used to have regular party executive meetings something that is not happening now under Sata. Sources said president Sata now seems to have left everything meant for the president’s office to his uncle Finance Minister, Alexander Chikwanda who insiders say is also being over-worked for his age. “I am sure you also heard for yourselves the president urging other ministers to emulate ba Chikwanda in terms of work-rate. But this man (Chikwanda) is really over-worked, especially for his old age, as he is made to handle most the issues meant for the president, even sensitive ones.” Sources said. And as part of his medication, president Sata will also not be handling a lot of out-door activities where he is expected to officiate but will be delegating ministers. Sources said the president can only be in public for at most an hour but strictly he is only supposed to be at a function for 30 minutes due to his condition. According to PF insiders, the apparent of lack of condition in cabinet and government is the direct result of the president who is not coordinating things due to his condition. “That’s why you see every minister or government official behaves as if he is a president himself or herself. Besides, there are outsides powers that have also taken advantage of the president’s condition and have usurped him a lot of powers by doing whatever they want. The Watchdog recently revealed that part of Sata’s medication is to suppress opposing views so as to reduce pressure on him. See story here.